The banner and back wall. This event served as our new banner’s christening! 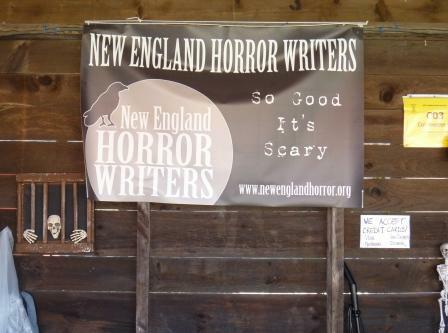 In the middle of September I had the privilege of working the New England Horror Writers booth with several other writers at the Hebron Harvest Fair in Hebron, Connecticut—and it’s safe to say that along with our foot-long hot dogs, fried dough and discovery that we all have memories of Charlotte’s Web in common, we picked up something else: a few epiphanies about all the other things we do as writers besides write. 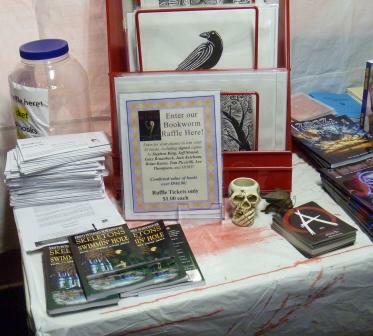 DanKeohane’s novels Margaret’s Ark and Solomon’s Grave on the table. 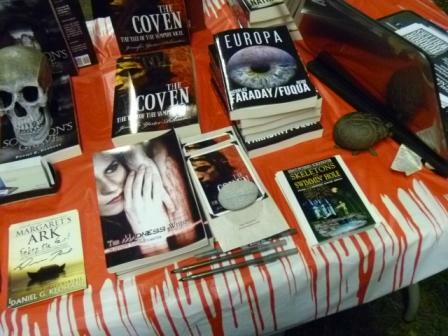 Also: Nathan Wrann’s vampire extravaganza Dark Matter Heart and Jennifer Yarter-Polmatier’s novels, including The Coven. Further down on the table, books featuring the shorts of Stacey Longo and Kurt Newton. 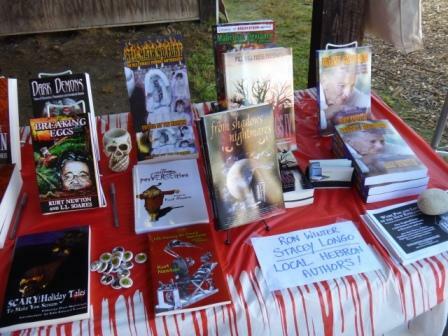 At left, Breaking Eggs, Dark Demons and Scary Holiday Tales, all featuring the work of Kurt Newton; Dark Things IV, From Shadows & Nightmares, and Hell Hath No Fury, featuring the work of Stacy Longo; and Granny Snatching by Ron Winter. A far shot of the left table. The etchings in the rack were done by Danny Evarts. 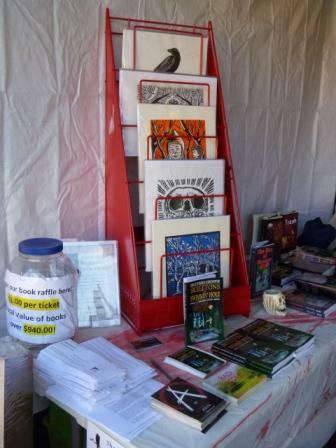 The raffle ticket jar is to the left; in front of that are the short stories and fliers we shared with passers-by. 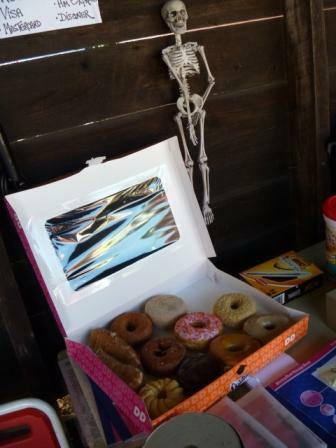 Skeletons in the Swimmin' Hole is at the front corner of the table. 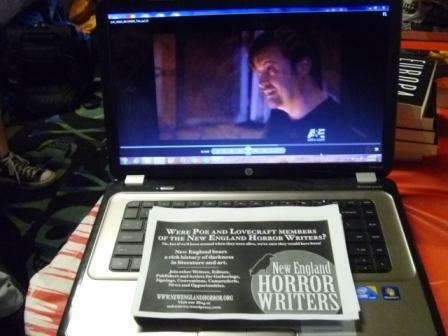 For more information about the New England Horror Writers Association, visit here: www.newenglandhorror.org. 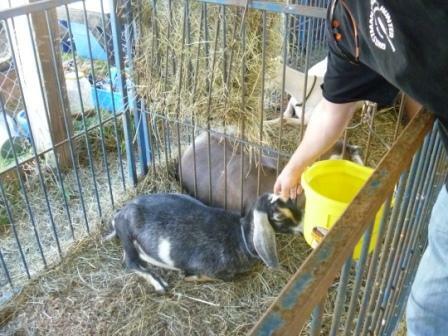 Below, photos from the entire weekend…including pics and video of the animals. Nathan grew up on a farm, so there was no chance we’d miss that—because sometimes what you learn while you’re doing an event isn’t just about writing, it’s about life, too. A far shot of the left table. The etchings in the rack were done by Danny Evarts. 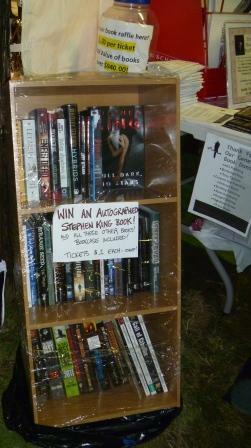 The raffle ticket jar is to the left; in front of that are the short stories and fliers we shared with passers-by. Skeletons in the Swimmin' Hole is at the front corner of the table. To the right are postcards for AnthoCon, an exciting brand new conference making its debut in November in Portsmouth, NH. Yes, I'll be there! Graphic novels by NEHW member Nathan Wrann, Granny Snatching by NEHW member Ron Winter, and The Man of Mystery Hill by NEHW member Tracy Carbone. 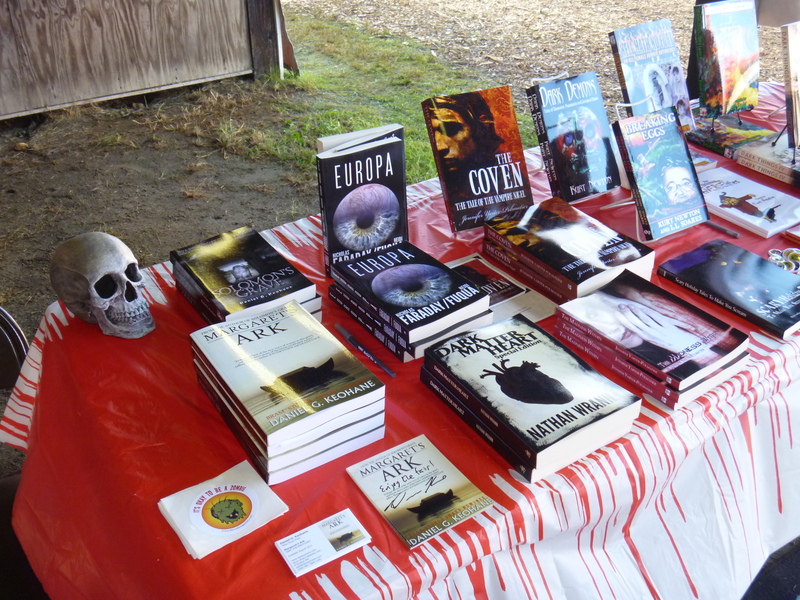 To the right, Shadows Over New England, by member Scott Goudsward, and behind that, the anthology How the West Was Wicked, which features one of Scott's stories. 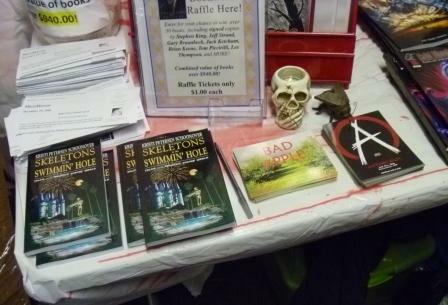 The Skeletons in the Swimmin’ Hole promotional postcards among other members’ books. 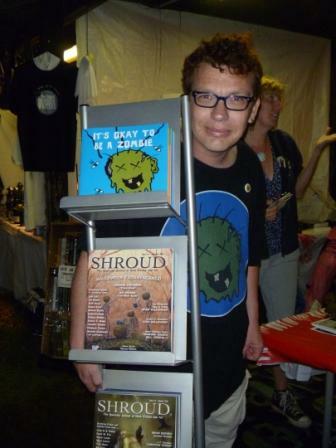 Danny Evarts, of Shroud Magazine and illustrator of the children's book It's Okay to Be a Zombie, poses with his stand. 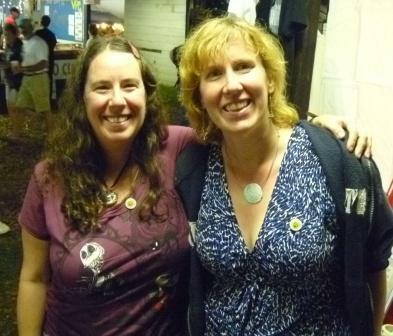 Left to right, me and Stacey. That's my new Nightmare Before Christmas t-shirt I bought at the Disney Store when I met Stacey and Jason earlier in the week at the WestFarms Mall to deliver books. 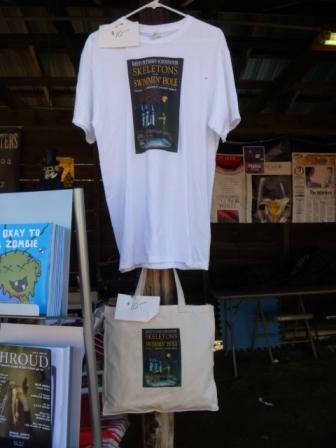 Skeletons in the Swimmin' Hole T-shirts and totes. The book is a collection of ghost stories set in Disney Parks (and I wrote it, so I feel weird saying by NEHW member Kristi Petersen Schoonover, but there you have it). 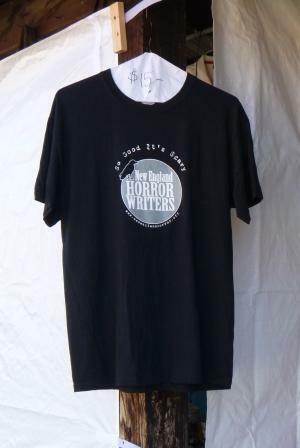 The NEHW T-shirts. 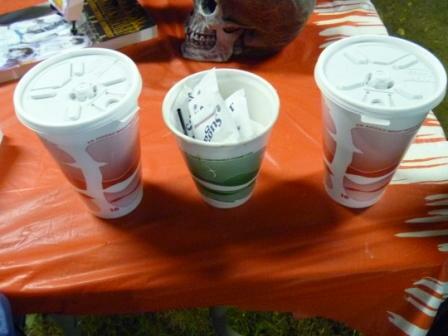 We sold a few of these! Nathan, of course, was there. 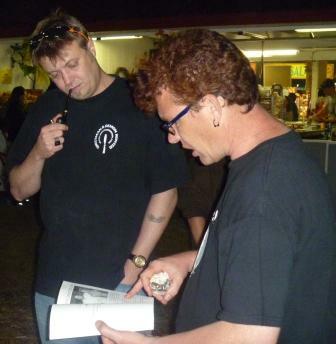 He had a reel of Extreme Paranormal, Paranormal Challenge, FearNet, and some other film projects running at night. The Friday Night crew! 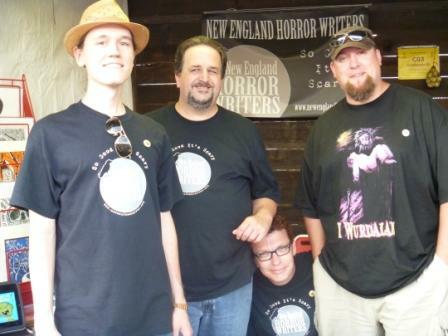 Left to right, Stacey, Jason Harris, who does the publicity for NEHW; NEHW member Kurt Newton, Danny, and me. 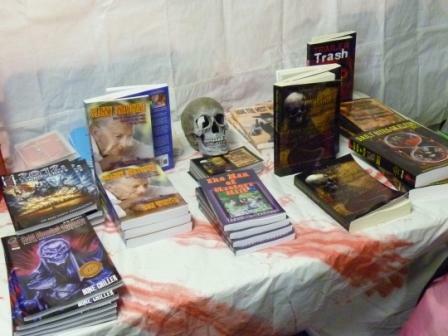 Kurt had several of his books available. If you look closely at the table it has been rearranged again so we could accommodate his books. 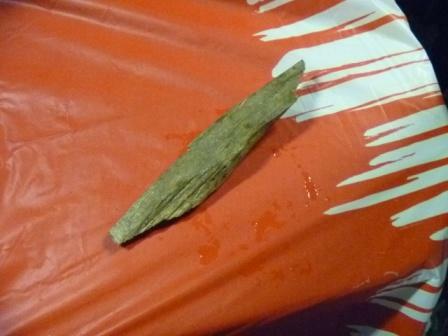 This is the piece of wood that went through my foot (if you read Kurt Newton’s column, in true horror writer fashion he tells the whole story complete with grisly details). 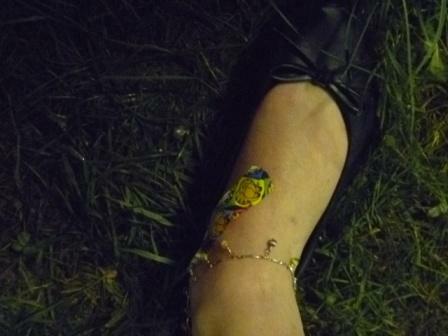 My foot after the “accident.” Yes, that’s a Garfield band-aid. That was all they had. Nathan and Jason stopped chatting for a minute so I could get their photo. 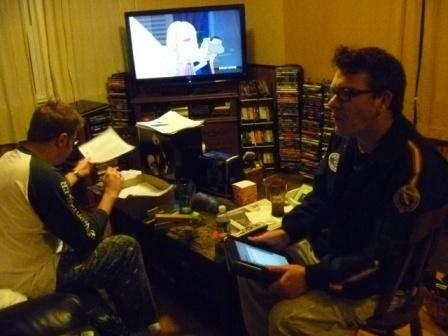 Late night Friday: Nathan works on stapling more short stories to hand out. 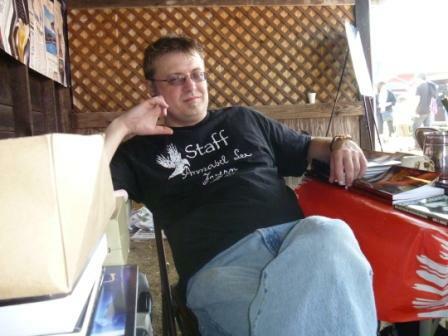 Writer/publisher of Shroud Danny Evarts on his Ipad. 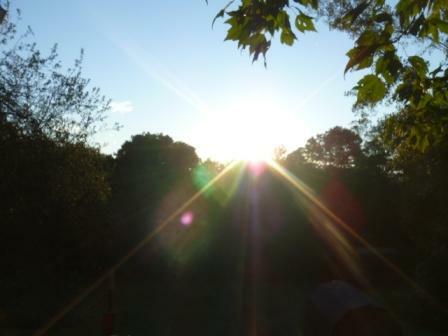 Hebron sunrise. Saturday was beautiful. 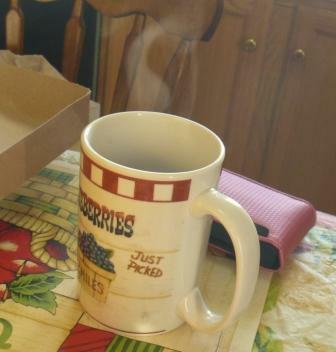 My coffee (and God I needed it) on Saturday morning. I took the picture because the steam (which you can see in the pic) was rising in a very interesting way and catching the sun from the kitchen window. Stacey split the board. 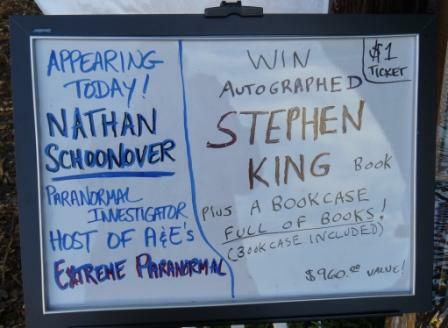 Many fans visited with Nathan -- it was cool. 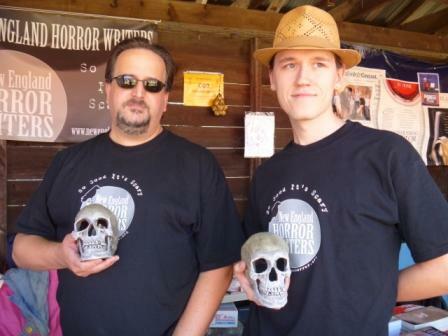 Scott Goudsward (Shadows Over New England) and Greg X. Graves do a little Hamlet! 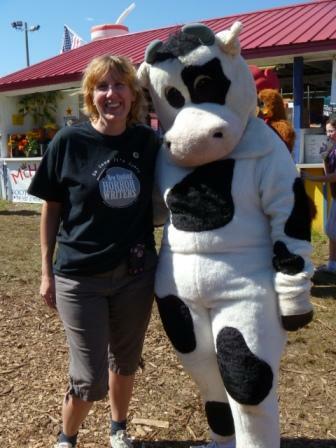 Stacey Longo and a cow. 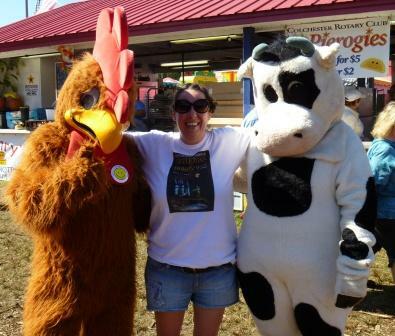 Me, a chicken, and a cow. Left, Scott Goudsward, me, center, Greg X. Graves, right. 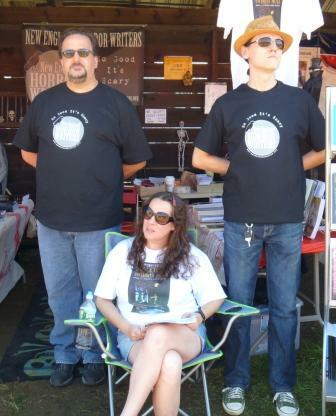 We were clowning around—I’m the celebrity and they’re my body guards. I don’t even know how or why we thought of doing this. It might have been my Jackie O-esque sunglasses. 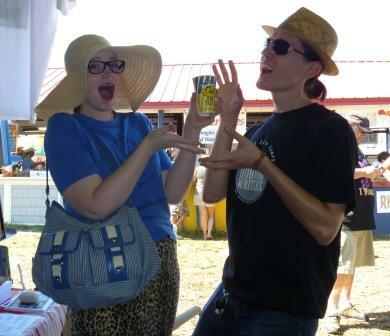 Greg X. Graves, left, and his girlfriend live in Rhode Island. 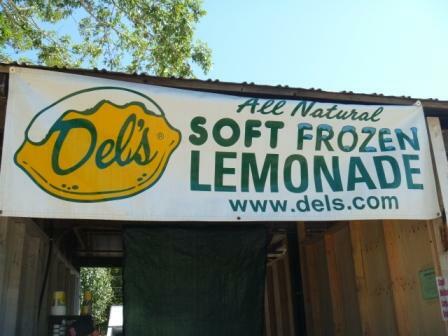 It was their first time having a Del’s. I just love this picture! 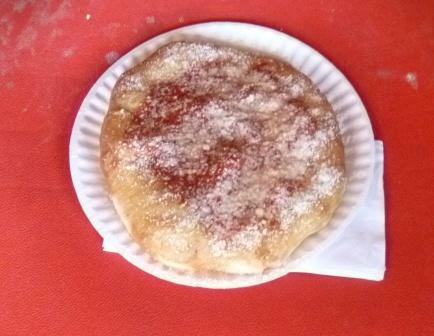 I had been hoping they’d have fried dough with tomato sauce—I look forward to getting it every summer, and this year I hadn’t gone to many fairs so I missed out. Boy was I glad to see Doughboy! 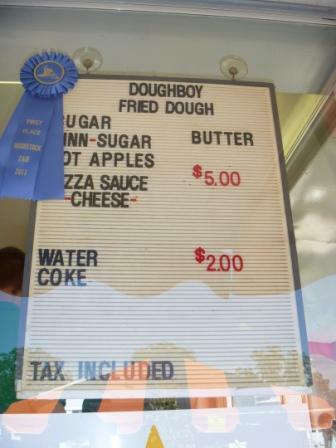 The Doughboy menu. 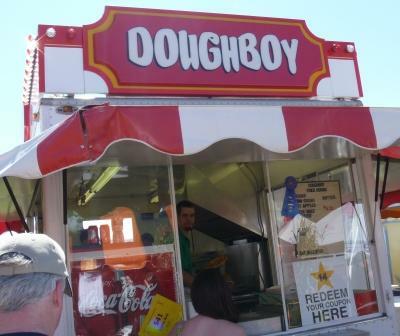 Doughboy has won best food awards the past three years at the Hebron Harvest Fair. 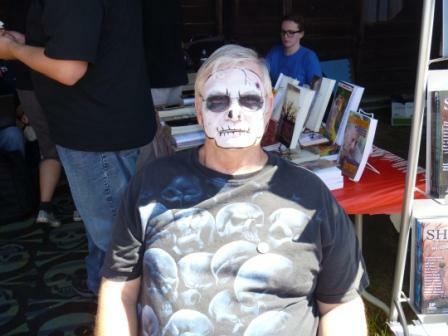 Writer Dan Foley got deep into the horror atmosphere by getting his face painted. 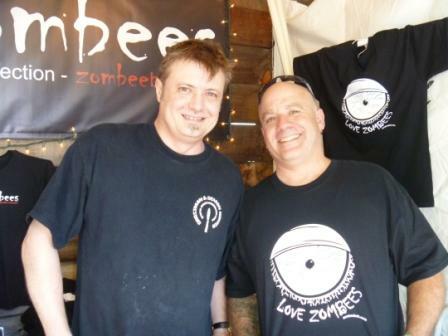 Nathan, left, and Zombee Bob. Don’t know who Zombee Bob is? Check him out at http://www.zombeebob.com. If you’re a zombie freak (or worried about the apocalypse), then he needs to be on your radar: he’s got great art, T-shirts, and more! 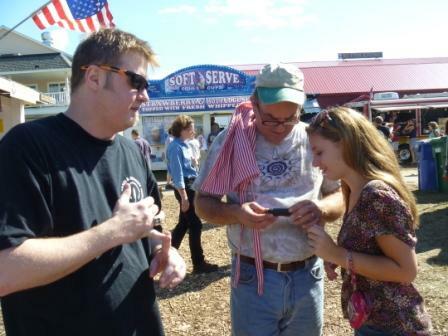 Nathan chats with a fan after she’s just had her photo taken with him. Nathan chats with the video club of the Regional Andover Hebron Marlborough--RHAM--high school about what it’s like to work in television. You can take the boy off the farm, but you can’t take the farm out of the boy: yes, there were signs everywhere advising against petting the goats (for obvious reasons, they are animals and unpredictable, after all), but Nathan, who grew up on a farm and raised goats, just wasn’t going to heed that. 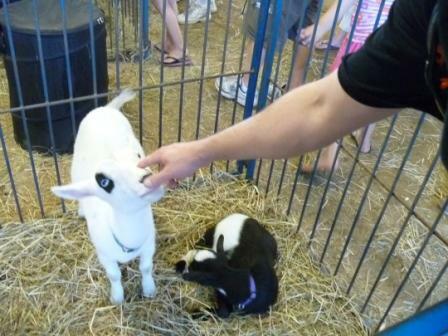 Here he is petting a little Saanen. When he was a child, he had a Saanen named Ghost. I swear: Nathan is the Goat Whisperer. 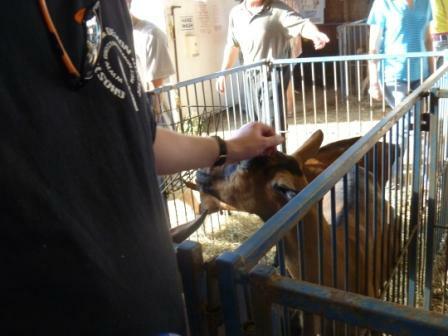 In this video, Nathan tells me about the remaining piece of horn in this Saanen’s head and what they will do to remove it. 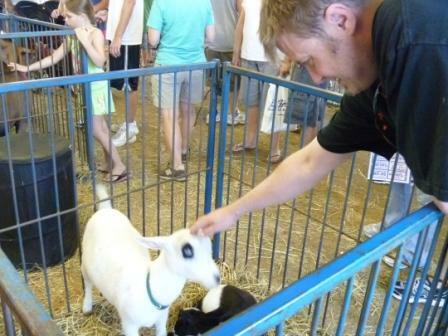 Here he is petting a Nubian. This one is a Toggenburg. 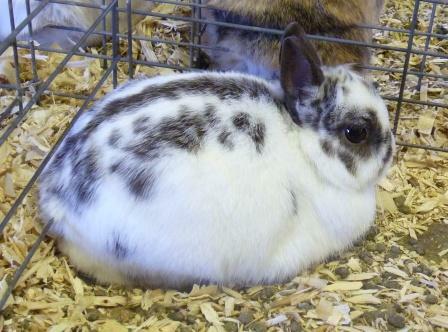 I have never seen a fatter bunny in my life. 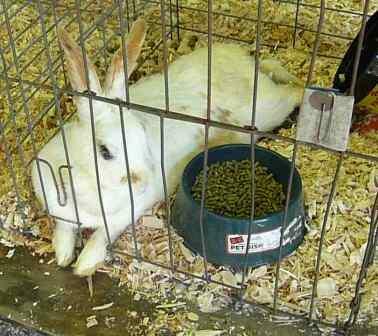 I felt bad for him, all pressed up against the wires like that. Do you think he was comfortable? He doesn’t look it. 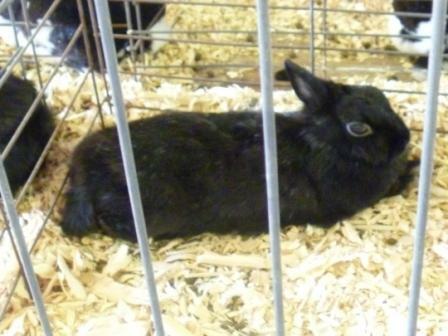 I took a picture of this bunny because he reminded me of my black cat Poe. 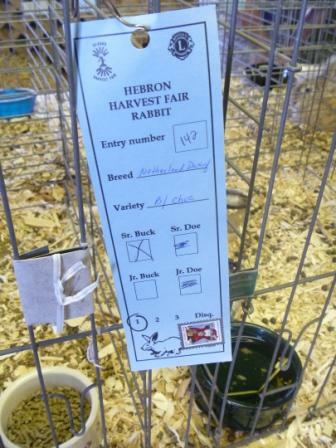 This is the information on the cute little dwarf bunny you’re going to see in the next picture. 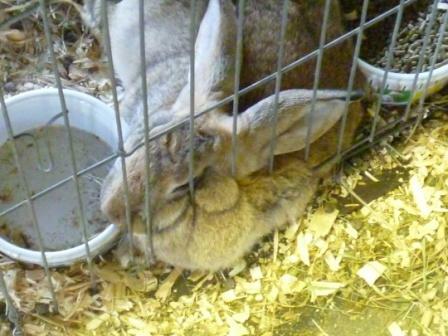 The dwarf bunny! I want one! Nathan said no. 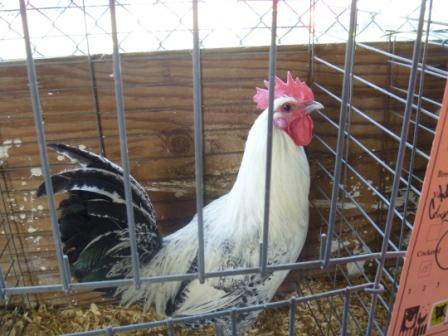 When Nathan was growing up on the farm he had a rooster just like this one. Its name was Kilcaise. The Saturday afternoon crew: Greg X. Graves, Scott Goudsward, Danny Evarts, and Kevin Wood (Shock Totem). 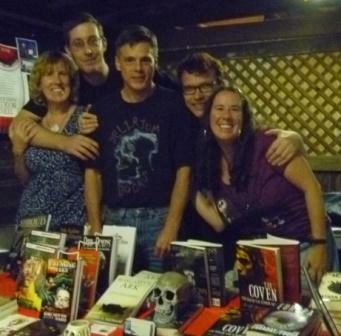 Me, left, posing with Scott Goudsward, author of Shadows Over New England. 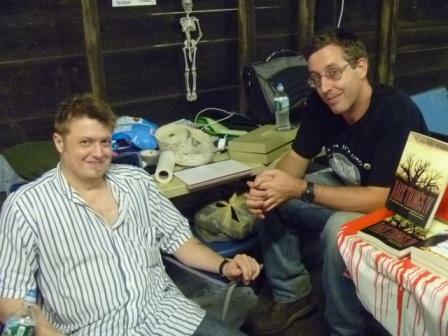 Nathan, left, and Danny discuss the coming Zombie apocalypse. 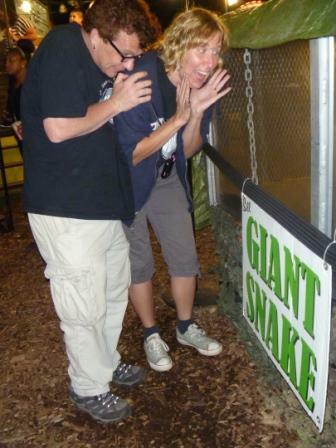 Danny and Stacey react to the giant snake that was over near the Hebron Harvest Fair’s midway. I have to admit, it was the largest snake I’ve ever seen! 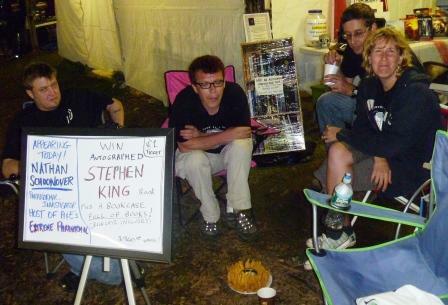 Saturday night chill-out: yeah, who can resist that good old greasy Bloomin’ Onion? 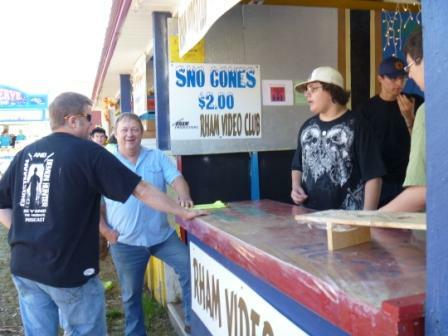 Left to right, Nathan, Danny Evarts, Jason, and Stacey. 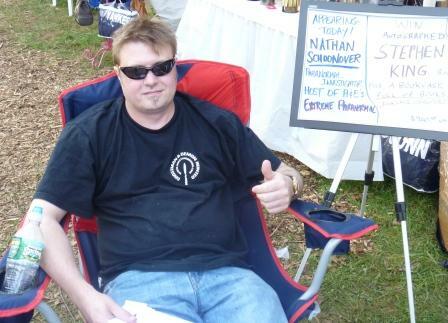 Sunday morning Nathan: I’m so jealous of that staff T-shirt he’s got from the Annabel Lee tavern in Baltimore, MD. 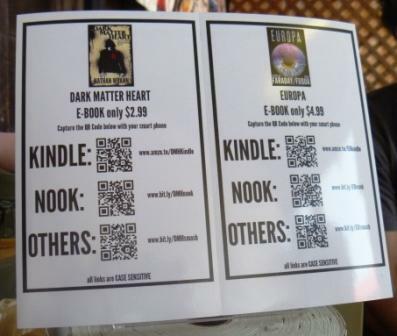 Writer and NEHW Nathan Wrann has these cards available for promoting his books at events—it’s a great idea, and for you writers out there, it can be done through http://www.bit.ly. 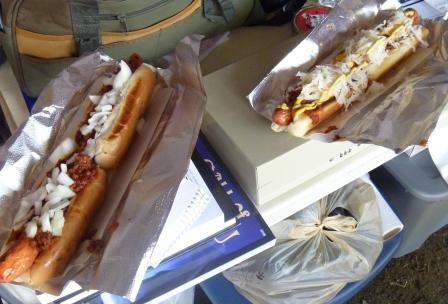 Sunday lunch: foot-long hot dogs. Delicious! 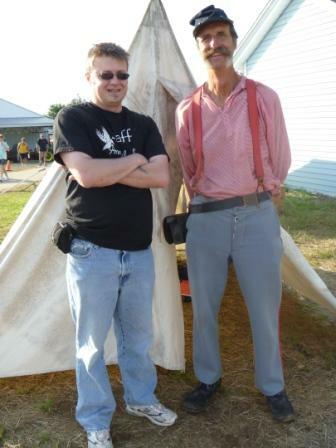 Nathan poses with a Civil War Re-enactor; there was an entire camp set up at the fairgrounds. This is called the “Oh my God it’s so late and we have all this packing up to do” survival kit. 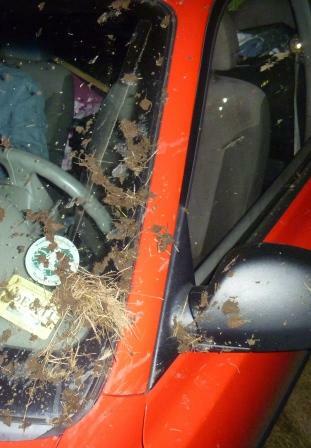 Ahhh, Connecticut farm towns, where there’s always somebody that has to mud bog. And no, it wasn’t me. 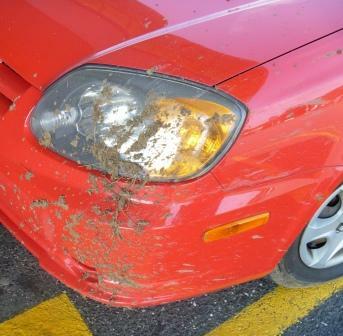 Another shot of the mud. We didn’t realize it had covered the headlight until the next day, and so we were laughing about the fact that on the drive home the previous evening we had been talking about how we both noticed my lights were a little dim. 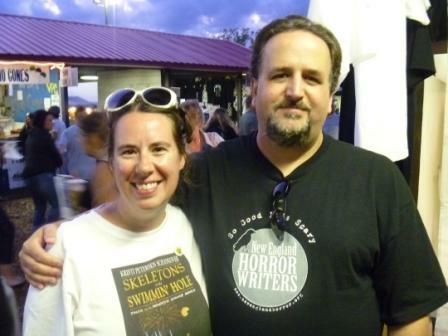 Posted on October 4, 2011, in Deep Thoughts & Fun Stuff, Skeletons in the Swimmin' Hole -- Tales from Haunted Disney World and tagged Danny Evarts, Hebron Harvest Fair, New England Horror Writers Association, Scott Goudsward, Selling books at country fairs, Shock Totem, Shroud Magazine, Stacey Longo. Bookmark the permalink. Leave a comment.